The most distant galaxy cluster yet has been discovered using Chandra and optical and infrared telescopes. At some 10.2 billion light years away, the galaxy cluster is seen when the Universe was only one quarter of its current age. This object, known as JKCS041, may help scientists better understand how the Universe developed at this crucial stage. This is a composite image of the most distant galaxy cluster yet detected. This image contains X-rays from NASA's Chandra X-ray Observatory, optical data from the Very Large Telescope (VLT) and optical and infrared data from the Digitized Sky Survey. This record-breaking object, known as JKCS041, is observed as it was when the Universe was just one quarter of its current age. 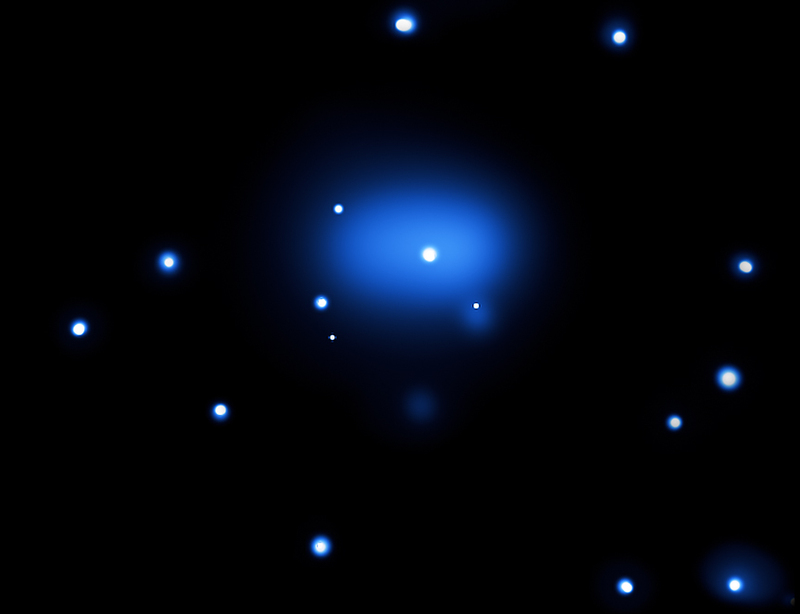 X-rays from Chandra are displayed here as the diffuse blue region, while the individual galaxies in the cluster are seen in white in the VLT's optical data, embedded in the X-ray emission. JKCS041 was originally detected in 2006 with infrared observations from the United Kingdom Infrared Telescope (UKIRT). The distance to the cluster was then determined from optical and infrared observations from UKIRT, the Canada-France-Hawaii telescope in Hawaii and NASA's Spitzer Space Telescope. However, scientists were not sure if it was a true galaxy cluster, rather than one that has been caught in the act of forming. The shape and extent of the X-ray emission in the Chandra data, however, provided the definitive evidence that showed that JKCS041 was, indeed, a galaxy cluster. The Chandra data also allowed scientists to rule out other possible explanations for the data, including a group of galaxies, or a filament of galaxies seen along the line of sight. Galaxy clusters are the largest gravitationally-bound objects in the Universe. Scientists have calculated when they should start assembling in the early Universe, and JKCS041, at a distance of some 10.2 billion light years, is on the early edge of that epoch. Follow-on observations of JKCS041 will provide scientists with an opportunity to find important information about how the Universe evolved at this crucial stage. Coordinates (J2000) RA 02h 26m 44s | Dec -04° 41´ 45"
The most distant galaxy cluster yet discovered. 10.2 billion light years from Earth. By combining X-ray data from Chandra plus optical data from the Very Large Telescope with optical and infrared data from the Digitized Sky Survey. The image is about 10 million light years across." 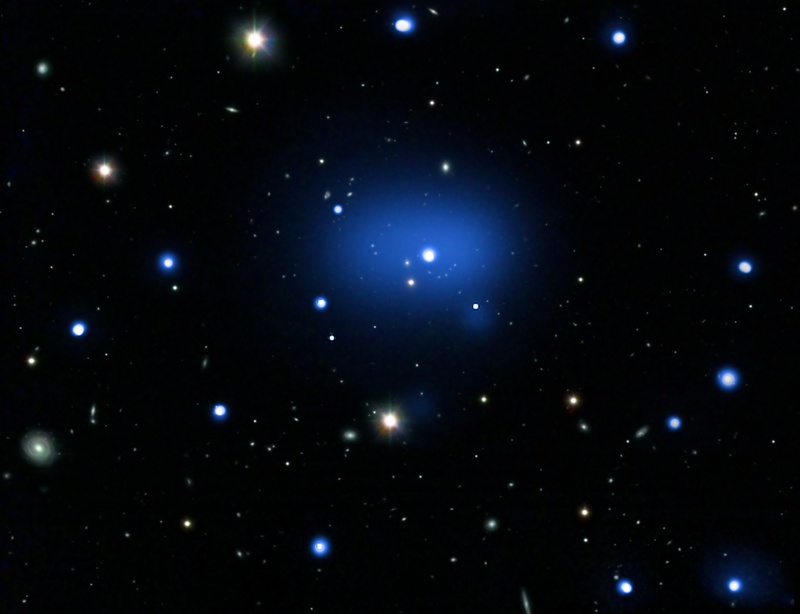 X-rays are in blue, while the individual galaxies in the cluster are white in the optical/infrared data. Click the wavelength buttons at the top of the image to view.